In a bowl, shred the tuna fish. Add the onion, tomato and chopped pepper. Combine all ingredients. Season with lemon juice, salt and pepper to taste, and stir to combine. Incorporate the chopped coriander. Fill the taco shells with this salad, add shredded lettuce (optional) and serve immediately. This menu is fresh and light, perfect for lunch or dinner. 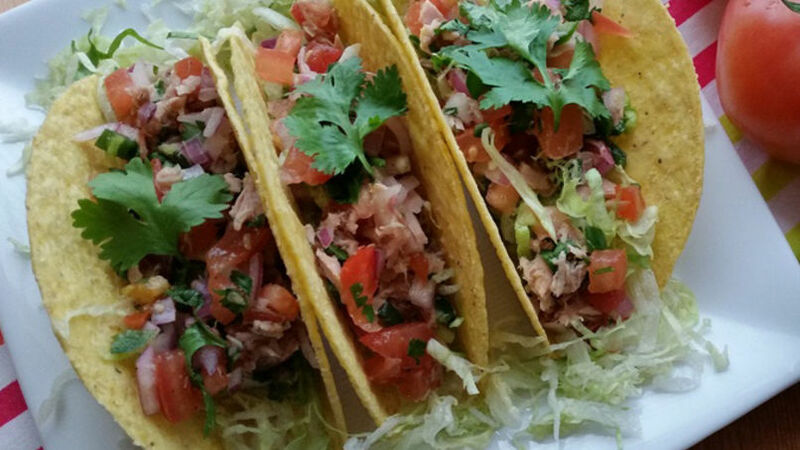 You can prepare the tuna fish salad ahead of time, and use toast in place of taco shells. My family loves tacos, and I often look for creative and different ways to serve them. I like using fresh ingredients that I can easily find in my local market to prepare a tasty yet budget-friendly menu. That's why today I am sharing with you some crunchy tuna tacos with the fresh taste of ceviche that always takes me back to the palapas setup along the stretches of beach across Mexico.